Structured by dates and locations, we are given the chance to experience the many different and instrumental periods of Kamal’s life. While reading this book, I could almost see a map in my head, bouncing from location to location, trying to picture where and how Kamal’s life was happening. Van Leeuwen gives very well detailed descriptions of the places Kamal lived and the people he held close to himself. In essence, Kamal’s story is that of his parents and of his own, neatly weaved together by the fabric of time and place. There are so many reasons why Kamal was unable to obtain the identity he so longed for. Of the many, most importantly seem to be that his birth was never registered in Zagreb, Yugoslavia in 1944 and his father’s political and moral loyalties. What I particularly loved about this book is exactly what I believe the author tries to convey: the importance of identity. 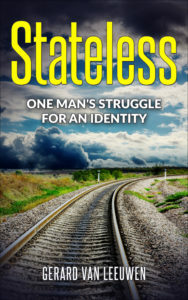 We can truly feel Kamal’s struggle to find his own identity when in the eyes of the state – any state for that matter – he simply did not exist. Identity and existential crises are at the core of growing up and learning how to navigate this world that we live in. For many of us, knowing exactly who we are and where we come from helps us with this quest: I am a daughter of immigrants, I have overcome severe anxiety and depression, I myself an immigrant, I am a cancer survivor. These are the things among others I know about myself and can reach for and hold onto when I am feeling lost. This absolutely resonated with me and put so much more emphasis and depth into Kamal’s story. For some, this may be a story of trying to get travel documents, but for Kamal, and many people in our day and age, this is a story of being treated and valued as an individual. I recommend this to anyone who is interested in learning more about how difficult it can be to know one’s self, when it feels like no one else is willing to validate their humanity. Thank you Darya for your wonderful review. You wrote: ‘this is a story of being treated and valued as an individual.’ That is exactly what I tried to do.